If you were a squirrel living in Southeastern Wisconsin, you’d be pleasantly surprised by the state of things. In many places, there are as many—if not more—trees than there were 200 years ago. But that rosy image doesn’t tell the entire story. Comparing the forests that cover the cities and suburbs around Milwaukee—and likely in many places around the world—is like comparing Rome before and after the fall. It’s still Rome, but it’s not quite the same as it used to be. Southern Wisconsin is a case study of the changes that were affecting much of the country in the 20th century. Most of the forests had been cleared in the 1800s by farmers, resulting in a landscape that little resembled what came before. The woodlots that remained were small and scattered. In one famous study, only 4.8 percent of the original forests remained by 1935. Milwaukee and its surrounding cities grew steadily in the run-up to World War II, but positively boomed thereafter. They needed room to grow, and since cleared land is easy to build on, farm after farm was subdivided. The path from forest to front yard seems clear cut. A woods is cleared to make way for farmland, which is later subdivided into lots and sold off to make way for homes. But the reality is much more complex than that. Though a neighborhood may maintain its wooded appearance, it’s original character is gone. 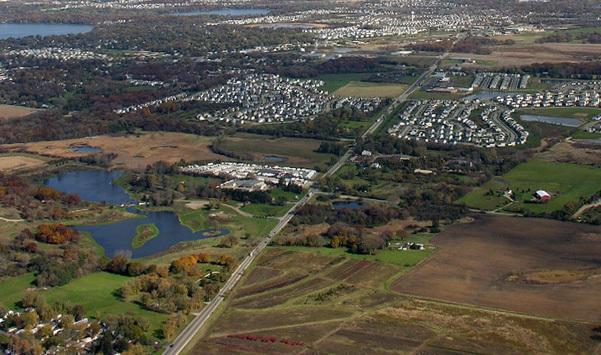 In Wisconsin, subdivisions are invariably preceded by farms. Farming is a tough life. There’s not much money to be made with a small family farm, and an farmer’s property often doubles as his retirement fund. To maximize the investment, he’ll usually subdivide it for housing. It usually works out well for him, because land that’s good for growing crops is also good for building houses—it’s not too steep and most of it doesn’t need to be cleared. That’s not to say farms are entirely devoid of trees. Most contain small woodlots and extensive fencerows that separated fields of corn, wheat, and soybeans. They’re relics of bygone forests, and in many places that’s all that’s left. Though the relationship is a bit one-sided, relic trees and farms have existed side-by-side for decades. Maintaining that landscape during subdivision isn’t difficult. Building houses around trees is easy if you don’t take a cookie cutter approach, and houses with big trees in their yards tend to sell for more. But conservation rarely happens. That’s the conclusion of one study of Southeastern Wisconsin. It looked at the fate of extant vegetation as farms gave way to subdivisions between 1937 and 1975. Though the sum total of forested land didn’t drop as much as anticipated, very little of the original vegetation that made it through the transition. By 1975, the trees that dotted subdivisions and roadsides were almost entirely new. That study reminds us that sum totals seldom tell an entire story. The relationship between forests, farms, and yards is complex and multidirectional. Forests are often cleared for farms, but abandoned farms can return to their forested state over time—much of New England underwent this process. However, urbanization can intervene along the way, removing the little remaining vegetation and replacing it with landscaped yards. But that’s not all the forest loss development is responsible for. Though many subdivisions are carved from land cleared previously for farms, they can be indirectly responsible for the loss of even more forests. Street and yard trees can’t offset this entirely. Similar patterns are well documented in developing nations. In Brazil, for example, expanding soy production has pushed cattle ranchers to clear land further into the frontier. It’s easy to forget these same processes are at work here in the United States. Even when subdivisions spring fully formed from forested land—skipping the intermediate farm stage—their lots are often cleared of existing vegetation. Some of my research in graduate school documented the stark changes forest edges undergo when houses move in. In old black-and-white aerial photographs, the bare earth of cleared building sites stood out in stark contrast to the dark gray of the surrounding woodlands. Straight, sharp lines separated the two. In time, the edge bled back into the yards, but it wasn’t quite the same. Suburban development isn’t going away anytime soon, but some of the structure and function of the old woodlands they replaced can be recovered. Homeowners can plant native trees. People can lobby their cities to plant native trees as well, rather than the whatever low-maintenance tree is in fashion among city foresters this year. The result won’t be the same as an intact woodland, but at least it will be similar.